Melvin Elwood Case (CRD#: 2393464, Jacksonville, Florida) is a prior general securities representative for LPL Financial LLC. Notably, on January 19, 2018, FINRA issued Case a $5,000 fine and six month suspension from having any association with a FINRA member in all capacities for failing to disclose a felony charge and guilty plea. Evidently, Case violated Article V, Section 2© of FINRA’s By-Laws in addition to violating FINRA Rules 1122 and 2010. On June 3, 2016, Case had been charged with exploiting an aged adult – a second degree felony. Apparently, he pleaded guilty to the felony charge on August 4, 2016. However, Case never updated his Form U4 to reflect that he was charged with, and pleaded guilty to, the exploitation of an aged adult. 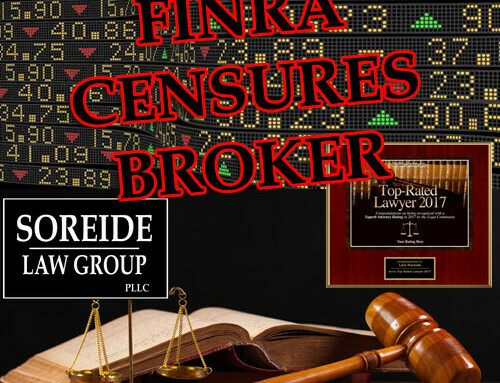 Moreover, FINRA stated that Case willfully violated FINRA Rules. LPL Financial LLC disaffiliated with Case on May 2, 2017. Notably, the firm cited allegations of Case exploiting an aged adult, converting money from the victim. An LPL Financial customer brought a complaint on August 24, 2017 about Case’s activities. Notably, the customer claimed that Case misrepresented the features or risks of a variable annuity. Secondly, Case allegedly gave the customer unreasonable advice about making a variable annuity purchase. Third, the customer contended that Case charged the customer inappropriate fees. Because of this, LPL Financial LLC opted to settle the customer’s claim on September 20, 2017 by paying the customer $9,023.67. Apparently, a customer of Pruco Securities (Case’s prior employer through August 19, 2008) filed a complaint about him. Specifically, the customer contended that Case gave the customer bad advice about insurance products. Not only that, but Case allegedly misrepresented the servicing and sale terms of an insurance product. Further, he allegedly failed to appropriately allocate the customer’s assets. As a result, the firm settled the customer’s claim on January 13, 2006 by paying the customer $100,000.00. Notably, Case contributed $66,666.67 towards the settlement. Have you experienced losses by investing with LPL Financial Broker Melvin Elwood Case? If so, contact Soreide Law Group at (888) 760-6552 and speak with experienced counsel about a possible recovery of your investment losses. Soreide Law Group represents clients on a contingency fee basis and advance all costs. The firm has recovered millions of dollars for investors who have suffered losses due to misconduct of brokers and brokerage firms.